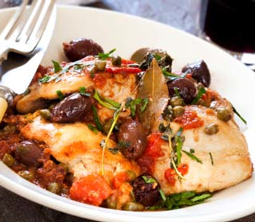 Chicken Marengo - A recipe from Savor California, the online showcase for extraordinary gourmet foods and beverages from California. Dredge chicken in flour mixed with spices. Heat all but 2 tablespoons of the olive oil in skillet. Brown chicken in olive oil. In separate saucepan, heat remaining oil and cook onions and peppers until they are limp. Add tomatoes, mushrooms, olives and bay leaf and stir well. Spoon over chicken and simmer about 45 minutes. Note: * Italian tomatoes make a HUGE difference in this recipe. They are sweeter and more flavorful.